Nonprofit association attorneys Heidi Christianson and Zach Crain have compiled a list of the top 10 questions their association clients have been asking about in 2019. 10/ We have been asked three times in the last month to endorse the products of a for-profit company or vendor that sells stuff to our members. Can we do that? Endorsing products and advertising result in unrelated business income. It is fine to have unrelated business income, but a tax-exempt organization must track and pay income tax on the net income from this type of activity. 9/ Keeping great talent has become a challenge in this economy. As a nonprofit, can we provide retention bonuses to our staff for staying with the association? Retention bonuses are a common tool used to retain employees. So long as the bonus does not constitute payment of the net income or dividends of the tax-exempt organization, payment of a modest bonus will not raise concerns. Tax-exempt organizations should use salary surveys to determine the reasonableness of compensation. 8/ Some of our board members cannot attend next week’s meeting, and we have an important vote. Can we have those board members send the Chair their vote by email in advance of the meeting? Proxy voting is not allowed for nonprofit board members. Nonprofit boards must take action either in person (or via teleconference) or in writing. Email works as a written ballot of the board member so long as the nonprofit has established that the email being used to vote is actually the email address for the board member. 7/ We are contemplating beginning a survey and report of prices members pay for a specific type of service common to members. Any problem there? Associations of competitors need to take caution not to violate state and federal antitrust laws when sharing competitively sensitive information. Member representatives should not see the raw price data submitted by member competitors. Association staff or a vendor should aggregate and report the data. It should not be current or future data. 6/ Can we pay our board members for services like speaking at conferences? Board members can be paid reasonable compensation for services provided. The Board should determine reasonable compensation in advance and observe conflicts-of-interest policies with respect to particular transactions. 5/ A few years ago, a committee of volunteers created an educational module (online learning and a skills test) to support one of our key initiatives. It has been very popular and generated significant revenue. Now, one of the volunteers is claiming she is the primary author and has legal rights to the module. Does she? We have seen an uptick in disputes between volunteers and association with respect to intellectual property. The general rule is that two parties who cooperate to develop intellectual property—like an educational module—co-own the property (they have the same rights to it). This can be avoided by having volunteers agree to assign their rights to the association. 4/ We want to provide private educational institutes for our members. Is that allowed within our tax exemption? Activities that directly further the mission of an association result in related function income to the association. Private educational institutes may further the mission, or they may be unrelated to the mission. Services for members that do not directly further the association’s mission will result in unrelated business income and are currently the main reason for revocation of tax exemption. 3/ When we sell our resources to members in the EU, we collect information via our website about those members. Do we have any new obligations under the EU’s General Data Protection Regulation (also known as “GDPR”)? GDPR is the latest law to provide new protection for information held about members. While GDPR only applies to EU residents, California has already followed suit, and we should expect other states to enact similar laws soon. These laws require that individual information be kept confidential, that people have the right to be “forgotten,” and that certain reports are made whenever there is a data breach. 2/ We want to provide disaster relief to members in the Carolinas. Can we do that? Consider using an existing entity such as an external or internal charitable organization to do this. If done within an association, an association should adopt a hardship policy and appoint a disinterested group of volunteers before providing hardship grants. Providing payments to members can be an audit flag. 1/ What are some ways we can protect our employees and members from sexual harassment? The prevention of sexual harassment is a continuing priority of associations. Associations have an obligation to prevent the harassment of employees, board members, volunteers, and members. Now is a great time to review your current policies and ensure that they provide a clear and confidential method of reporting conduct that may be harassing, and a procedure for the investigation and resolution of any such reports. Be sure that staff and board members are trained in recognizing potential harassment and understand how to handle a report. Some organizations are also using confidential “hotlines” to encourage timely reporting of any issues. Click here to download a PDF version of this Top 10 list. 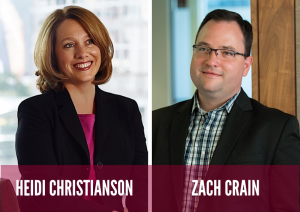 To speak with Heidi and Zach about nonprofit association issues, contact Heidi at hchristianson@nilanjohnson.com or 612.305.7698, and contact Zach at zcrain@nilanjohnson.com or 612.305.7725. See what NJL does for nonprofits and associations here.